Air conditioned apartment - residence with swimming pools on the beachfront. 2 bedrooms - AAC included - parking + linen available - facing the beach. 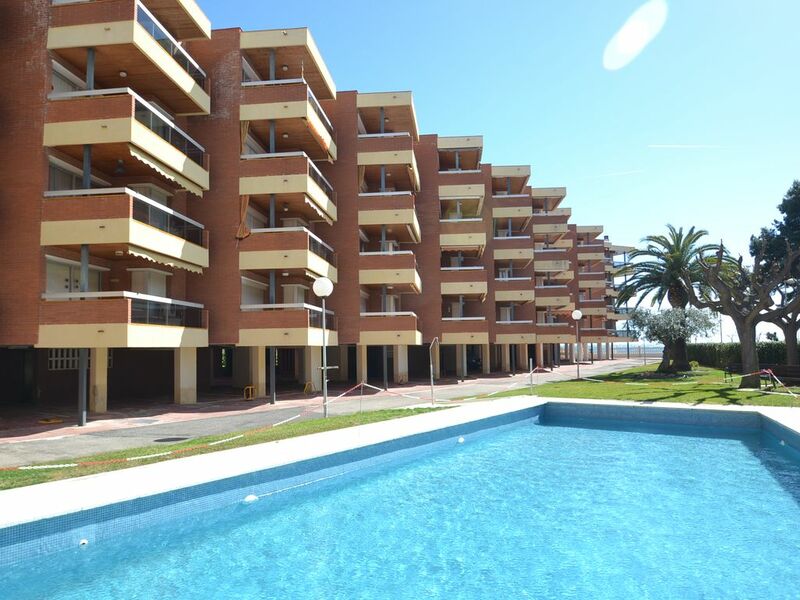 Apartment with an ideal situation in a residence with swimming pool on the beach front in Cambrils Vilafortuny. This is a spacious and bright property which counts with two double bedrooms, a complete bathroom (with either a shower or a bathtub), an equipped independent kitchen as well as a living room. It has been comfortably furnished with a dining area as well as a relax zone with sofa-bed in the living room where a wide picture window allows direct way out to a completely fitted out terrace with a table, chairs and a rolling sun blind. Completely equipped with the air conditioning included, you can get, if you want, get the linen (sheets and shower towels, available on request with the fee if 30 Euros per booking and changed each week) and / or a private parking spotr in the residence (available on request with the fee of 12 Euros per day). These residences are perpendicular to the beach front and the terraces have views onto a green zone and lateral beach view. They are family residences with 3 different swimming pools (one in each residence), 2 of them with a separation in the pool for children. The three of them have outdoor showers, elevators and, above all, direct access to Vilafortuny's fine sand beach. They have a privileged situation, just before a large fine sand beach and the maritime promenade which goes along the beach in Cambrils Vilafortuny, ideal to go for a walk or for a ride, and links the seaside resorts of Cambrils with its little port and Salou with its famous Port Aventura theme park. Vilafortuny's beaches have been completely fitted out with showers and surveillance posts, little bars and restaurants with terraces, little shops and, in the sand, sun beds and sun shades as well as beach huts. This property is highly recommended for families who wish to enjoy the joy of both the beach and the swimming pool yet being in a quiet environment. The pictures which have been associated to this property are transmitted as informative tools given a few details may vary from one apartment to the other in this residence. With its ideal location, in a residence on the beachfront with a community swimming pool, this air conditioned apartment is absolutely perfect for you to have an excellent stay with your family; it allows you to access directly and easily, thanks to the famous maritime promenade, to both seaside resorts of Salou on the othe hand and Cambrils on the other hand and you can rent a private parking spot (with supplement). - Functional apartment with 2 double bedrooms + 1 sofa-bed in the living room. - Air conditioning included and optional services: parking spot (84 Euros per week) and linen (30 Euros per stay). - Beachfront with a direct access from the residence where you'll make the most of the two swimming pools (adults and children). Air conditioning included: in the living room as well as in the main bedroom. Optional private parking spot: 84 Euros per week. Living room with dining area and direct way out to the pretty furnished terrace. Pretty furnished terrace with table, chairs and a lateral view onto the sea. Pleasant community swimming pool with one part for adults, the second one for children, outdoor showers and direct access to the beach from the community area. Very complete apartment for an all-con stay - air conditioning included - ideal situation, facing the fine sand beach, the maritime promenade and close to all kinds of facilities and activities. At mid-distance between Cambrils and Salou stands the family residential area of Vilafortuny with its little convenience stores just by the beach and a beautiful maritime promenade, to go for a walk or for a ride. Cambrils is a very charming seaside resort, standing 100 kms South from Barcelona, 10 kms from Tarragona and its rich cultural patrimony, classified by the UNESCO, and 5 kms from Salou. It has been known for long by French tourists for the quality of its fitted out beaches, its little port, gastronomy and its long maritime promenade allowing to reach, by the beach front, the famous resort of Salou. Soutwards and in the direction to Miami Playa stand the residential areas of La Llosa, Mediterraneo and Tarraco. Salou is a very tourist seaside resort which offers all kinds of activities among which the famous Port Aventura theme park, one of the biggest ones all over Europe. Its festive reputation turned it into one of the most fashionable seaside resorts all over Costa Dorada and Spain. Northwards stands its very animated centre, a real paradise for young holiday-makers abdm Southwards, the urban centre, more appreciated by families, with the Miramar maritime promenade to reach Cambrils. It counts with 8 fine golden sand beaches and creeks, linked to one another thanks to a recently fitted out footbridge called “El Camino de Ronda” and the Jaume I maritime promenade, lined with pine trees, palm trees and fountains.